First up is this tablecloth for the shop cutting table. The edges of the unfinished top were giving our sweaters fits! My first thought was to cut the laminated cotton to size, drape it over those offending edges, and call it. 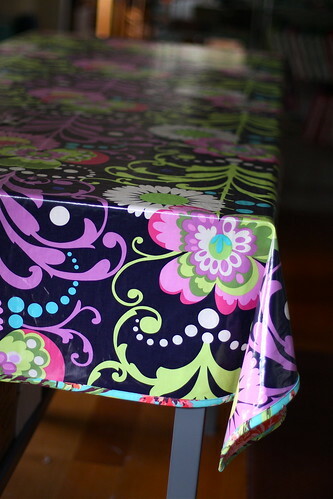 I then had the idea to make a full fledged two-sided tablecloth. Several advantages: 1) it added a nice weight to the table covering so it wouldn’t move around and 2) it added some flexibility for future use. Finished size is 10 feet by 54″. I envision also using the tablecloth to cover a standard banquet table. First up: my table at the upcoming Indie Banditas craft booth. I also see the laminated side being perfect for birthday parties on the front porch. 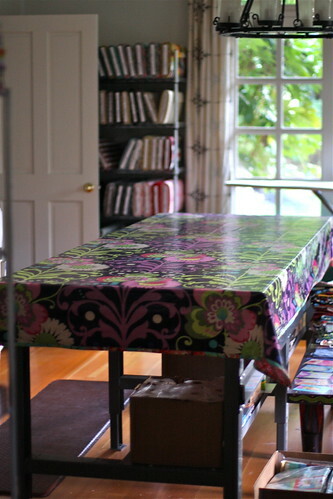 And what about the cloth side when an extra table is needed for entertaining inside! The cloth side is from the Amy Butler Love Collection home decor line. I pre-washed the home dec fabric and dried it in the dryer. It laundered beautifully. I selected this particular print because it reminded me of a classic damask tablecloth. I chose home dec because the width (54″) matched the laminated cotton fabric width saving me a step by not having to piece the back. Construction was straightforward: I placed the laminated cotton face down on the floor. I layered the home dec cloth face up on top (wrong sides together). Both fabrics were 54″ wide but the home dec measured out a bit more narrow which is why I placed it on top. I pinned the edges. 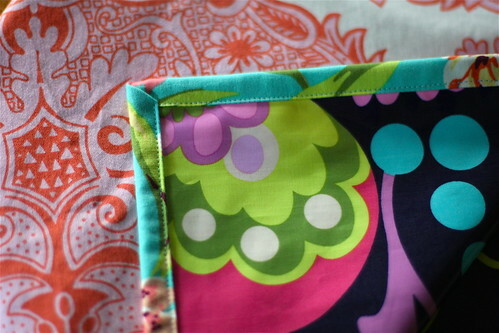 I sewed the first edge of the double fold french binding (Bliss Bouquet Teal from the Love quilting cotton collection) on at the same time as I sewed the layers together (eek, I know, pretty risky, but it worked and saved me lots of time!). 10 feet by 54″, yep, a very heavy project to maneuver through the machine. I used my walking foot to keep everything moving smoothly. To finish the binding, I flipped it to the laminated side and sewed the second edge down by machine. I chose not to do a ‘right sides together and turn inside out’ approach which also could have worked. 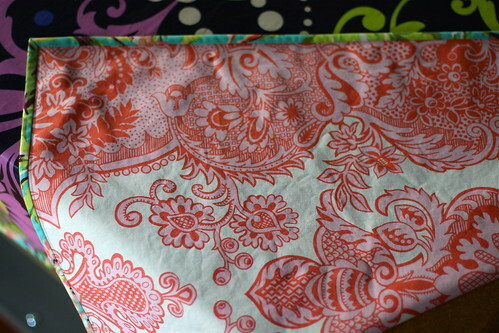 I just LOVE the look of a binding on anything and decided I wanted that third element of color in the mix. I was also a bit concerned about not getting the edges of the laminated cotton to lay flat. I would have had to topstitch all the way around the edge anyway. If I was already doing that loop why not make it a sewn on binding. I’m really happy with this project. It’s a unique table covering that can be used in a number of ways. We all LOVE the color it’s added to the cutting room. A very happy addition.